This image shows Nguyen Thi Tru, a 122-year-old Vietnamese who has been named the world's oldest living woman. A 122-year-old Vietnamese has become the world’s oldest woman, which means she will be eligible for a US$1 million sum offered by a Moldovan multi-millionaire if she remains alive next year. The Vietnam Book of Records (Vietkings) on Thursday said that the World Record Association (WRA) has recognized Nguyen Thi Tru, a resident in Ho Chi Minh City, as the world’s oldest living woman. The WRA officially announced the recognition at 3:00 pm on April 20, 2015 in Hong Kong, where the organization is based. Moldovan multi-millionaire Dmitry Kaminskiy, who himself wants to live forever, has promised he will present $1 million to the first person in the world to reach the age of 123, Inquisitr reported on April 12. That means Tru, who has lived through three centuries, is facing an opportunity to win that prize if she will be still alive next year. “I hope that my prize will help some of them desire longer lifespans and make their approaches to living longer a little more competitive,” Inquisitr quoted Kaminskiy as saying. Tru, who was born on May 4, 1893, has eleven children, only two of whom are alive and in their eighties now, according to the Vietkings. 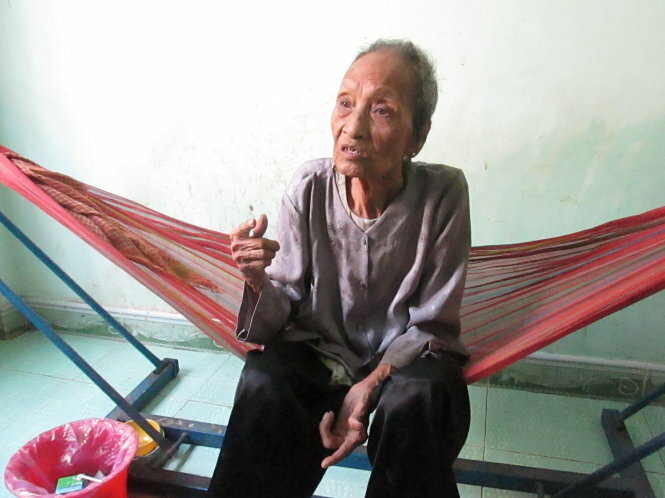 The woman is living with her youngest daughter-in-law, 76-year-old Nguyen Thi Ba, in Hamlet 5, Da Phuoc Commune, Binh Chanh District. Tru has led a long, healthy life and has never been hospitalized for any serious illness, Ba said, adding that her mother-in-law’s routine meal includes rice porridge with pork, milk, and a soft dessert. The secret of longevity of the world’s oldest woman are likely to be her kind-heartedness, benevolence, and willingness not to envy others, according to Ba. On April 22, a Vietkings delegation visited Tru at her home, while some WRA representatives are scheduled to come to Vietnam in June this year to call on her under a Vietkings arrangement. Guinness World Records announced on February 27, 2013 that Japan's Misao Okawa was the world's oldest living woman, at 114 years and 359 days old then. Okawa died on April 1 this year.